Whether you work with Dr. Skube as an executive coach or a counseling client, you’ll have the advantage of her uncanny intuition about what is around the corner for you. She will also work with you to teach you to use your own gut instincts to effectively navigate any critical decisions that keep you awake at night. Your peace of mind, your timing, and your quality of life will benefit enormously! 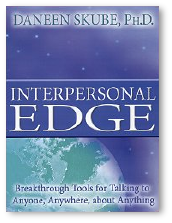 Develop in-depth understanding of the hidden agendas of others. Use your inner “crystal ball” to see how decisions will work out before you make them. Recognize powerful crossroads and chose the path that is optimum for you. Perceive who is your ally and who is your adversary. Learn to work with dreams or meditations to gain access to your own wisdom. Perceive problems before they occur. See opportunities that others miss. Discover you are your own Psychic Friends’ Network.